Cyndi Boissoneault is the loving wife of Doug, the loving mother of Michelle, Danielle, and Doug, and the proud grandmother of Kaden, Brayden, and Talan. Cyndi loves scrapbooking functions, shopping, and of course, being a super Grammy to our grandchildren. Cyndi is known to many of you as your dictation needs support person and caring friend at Central Voice. Unfortunately, Cyndi’s liver started failing at the beginning of this year. The doctors suspect prescribed medications caused the failure. She has been placed on the liver transplant list with Shands Hospital in Gainesville and is eagerly awaiting her new liver and her old life. After Cyndi’s initial diagnosis she has had a very bad four months. She has been hospitalized three times, including her current stay in ICU at Shands. 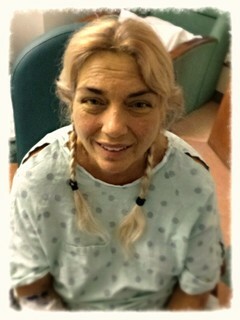 She has undergone all the tests, surgeries and invasions with courage and humor. A liver transport is her only chance of survival. Her bravery and strength have been an inspiration to all of us. She is our hero. The financial burden of this transplant and after transplant costs, medications, lodging, and food will be high. To help with these costs we have established a fundraising campaign with HelpHOPELive, a nonprofit organization that has been assisting the transplant community for 30 years. . All contributions are tax deductible, are held by HelpHOPELive in the Southeast Kidney Transplant Fund, and are administered by HelpHOPELive for transplant-related expenses only. Please consider making a contribution to help the loving mother/wife/grandmother in these trying times. Your support is crucial! On behalf of the Boissoneault family, we thank you for your kindness and generosity. Cyndi and family, we are carrying you in our hearts and sending healing energy. Carole and all at GMTS, Inc.